The A.V. Club: This episode is so tragic! AVC: So is season three going to reveal Will Graham’s amazing crime-solving cousins Coy and Vance Graham? Is that where we’re headed? BF: [Laughs.] I think for season three, in continuing our mash-up of Thomas Harris’ DJ instinct, we will blend of the novel Hannibal and also the novel Hannibal Rising and doing our own version of the Hannibal Lecter origin story, which will bear no resemblance to what is in Hannibal Rising. AVC: When you sat down to start writing the season, were you always building to this moment? BF: This was the moment about halfway through season one where I was very confident that this was where we had to be rocketing toward, and, because we opened the season with the fight with Jack Crawford, I knew that was going to take place somewhere around the middle of the finale, and I knew Hannibal was going to get away to create our fugitive storyline for season three. And I knew he had to leave everybody dying. The audience doesn’t know, beyond the wiseacres who will say, “Well, they’re not going to kill Will Graham,” who’s going to survive—or not, because Alana is lying dying, Jack Crawford is lying dying, Will Graham is lying dying, and Abigail Hobbs is lying dying. So in that way, if we hadn’t gotten a season three, I was, like, well this is probably perhaps the most depressing series finale [Laughs.] that we could have conceived of for this show. So I’m glad there’s a season three, so we can kind of pull some irons out of the fire and continue telling the story of Hannibal Lecter and Will Graham. AVC: Was there a moment when you were worried this would be the series finale? BF: Oh yeah. There was, I think because of the show’s very tricky reception in terms of ratings, there was always the question of, “Well, this could be it.” If it were, I think there’s something powerful about Hannibal Lecter dropping the mic and walking off the stage in the manner that he does. In that sense, if you are a Hannibal Lecter fan, and he is the character that you’re rooting for, it’s a happy ending! But hopefully, the audience isn’t entirely rooting for him, but I’ve talked to friends and my partner, and I was like, who’s your favorite character on the show, and everybody always says Hannibal. And I was watching the penultimate episode with friends, and when Hannibal got tased, they were all like, “Aww, leave Hannibal alone! What’s he done?” So Mads Mikkelsen’s performance is very seductive that way. AVC: We never saw Abigail die and we never saw Miriam Lass die. Are you establishing that if we don’t actually see the death that there’s always a chance the character could come back later? BF: Not necessarily a hard and fast vocabulary, but with Abigail and Miriam, it was absolutely intentional, because we wanted to have both of those characters come back, and I remember the conversation I had with Kacey Rohl before we started filming the penultimate episode of last season where her character apparently dies. I told her very directly, “Everybody’s going to think you’re dead, you’re supposed to be dead, but the idea is to bring you back in season two. 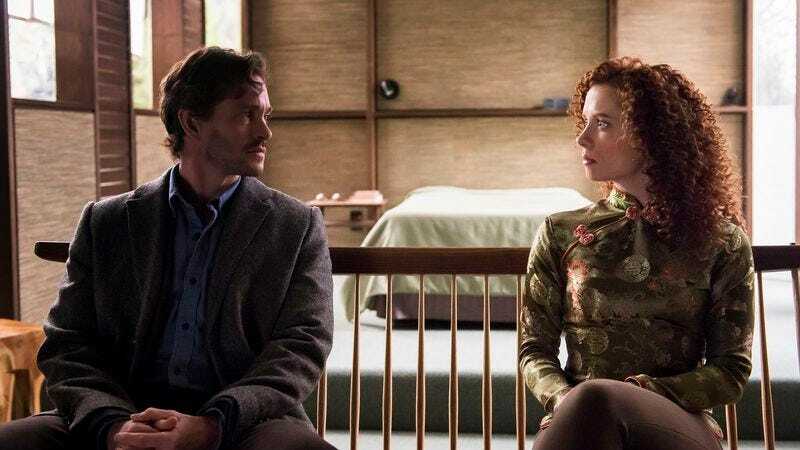 Chances are it won’t be until the very end.” But she’s still alive, and what is that story that took place between Hannibal Lecter and Abigail Hobbs while we were watching all the proceedings of Will Graham in the asylum? AVC: Did you think about playing that card earlier? BF: The intention was always to have her appear in the finale. When we were trying to figure out Gillian’s schedule to get her back, because we knew we wanted to have a reveal of sorts in episode 12 with a surprise witness who was hopefully going to give Jack Crawford the information that he needed to finally prosecute Hannibal Lecter, there was a brief moment when it didn’t look like we would get Gillian that I was thinking, well, maybe we pull up the Abigail story and do with her what we were going to do with Gillian, and then Gillian broke her back to make the show possible. AVC: It seems like you’ve been holding back on depicting Hannibal’s crimes as they happen, and this episode really reminds us of what a dark and terrible person he is. How do you decide when to depict him being pure evil? BF: I think, because we want to confuse the audience in terms of how they should feel about this character because he is a bad man, that if we constantly showed him as a bad man, then it’s going to be very easy to hate him. But if we show him only doing these bad things when we absolutely need to, then I think it gives us the real estate to rationalize why he is so seductive for the other characters in the piece. Why Will Graham is confused about the way he feels. Why Abigail Hobbs is confused about the way she feels about him that because they, like the audience, see all of these intriguing aspects of him and these very seductive elements of his character. So to complicate it with a lack of clarity felt that it was getting the audience in the right place for them to understand where the characters are. If that makes sense. AVC: Did you try versions of the scenes where Will and Jack talk about their plan or let others in on it? BF: The show goes by so quickly when I’m watching it, going “Oh my God, it was so excruciating to make and write and produce,” and then, blip, it’s 42 minutes, and you’re gone. So the real estate for storytelling is so valuable that if there’s something that I feel like the audience can make the connection with without us having a long, shoe leathery scene, I will absolutely go that route and just put my confidence in the audience to figure it out and make those connections without having to spell it out. AVC: Okay, I’ve just got to ask. Is everybody dead? BF: [Laughs.] Not everybody is dead. But not everybody lives. AVC: This season, did you have some episodes you thought worked particularly well or some episodes you thought did not? BF: I think, for me, the courtroom episode is one that if I could do the season again I would eliminate. Just because it was such a departure from the style of the show, and it felt like we weren’t doing anything particularly special in it that validated its existence in the lexicon of the season. That would be one that I would take out into the field and tell to stare at the flowers. I’m generally very happy with the season. I loved the two-parter coming into the season. I thought that was a really interesting, strong way to set up the new season. I loved episode four with the story with Jack Crawford’s wife paralleling the Amanda Plummer story. I enjoyed episode five. That was Will Graham turning Hannibal Lecter from inside the asylum and actually launching an attack from that safe place. The Verger story, I think, was mostly successful but had some bumps along the way integrating these two characters into the world that I think early on was a little shaky, and then by the time it got to 12, I felt like we understood their role and hit a stride with that. Twelve is one of my favorite episodes of the season, just because I think Michael Pitt is so much fun, and it’s Will and Hannibal as murder husbands, so there’s a lot to be had with the tone of the comedy and brutality of that story. I think I would like to have more of that tone in season three, with a little bit more of the humor than we had in season two. And I felt season two had a bit more humor than season one, so I feel like as we evolve, we have to keep folding into the omelet of the show different elements that continue to expand our own vocabulary, so every season of Hannibal is its own novel.